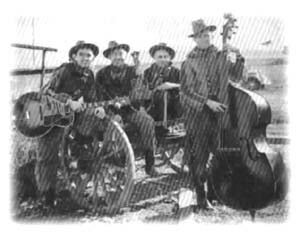 The Drifting Pioneers started making music together traveling together with various "Prairie Farmer" shows and other theater units throughout the country. 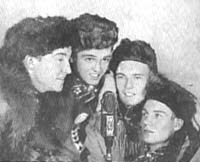 The began making radio appearances over a small station in Illinois and soon were appearing on other stations in the midwest. They stated at WLW in Cincinnati in 1937. 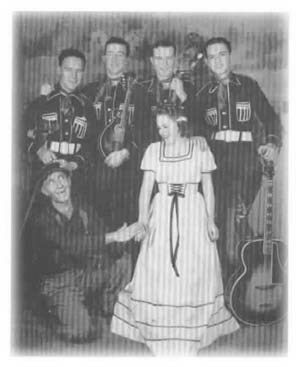 Upon hearing Judy Dell sing some of her mountain songs in an appearance on WLW, the Drifting Pioneers decided they needed a female singer in their act. Judy was just a teenager approaching twenty years of age and barely five feet tall if that. The group also added Denny who provided the comedy relief. Walter and Bill Brown were brothers and were from Springerton, Illinois, a small town in southern Illinois near the Indiana state line, just north of Mt. Vernon, Illinois. Walter was the younger of the brothers. Morris Marlin was a native of Carmi, Illinois (just east of Springerton) and did most of their vocal solos. Merle Travis, even back then was already making a name for himself as a guitar player, was from the hills of Kentucky, Drakesboro. Merle was also the youngest in the group. 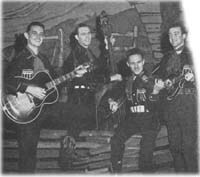 They wrote in back about 1941 that "When Happy Hal introduces Merle Travis and the Drifting Pioneers, you're bound to hear fiddlin', guitar-pickin' or old-fashioned singin' done in true southern style." They sang as a quartet and its said their renditions of hymns, gospel songs and spirituals were hard to top. Drifting Pioneers Song Folio No. 1; 1939; American Music, Inc.; Portland, Oregon. Favorite Songs of the WLW Boone County Jamboree; 1941? ; M.M. Cole Publishing Co.; Chicago, Illinois.